From the proper steps for striking the ball with power to his exclusive secret for pinpoint accuracy, every facet of your kicking game will improve. Dallas Cowboys’ coach Steve Hoffman reveals techniques and training programs – proven in the NFL – that will dramatically improve the distance and accuracy of every kicker. Secrets to Accurate Field Goals and Consistent Punting! Dallas Cowboys’ Coach reveals 20 years of experience on this kicking video! This complete kicking program reveals the proven secrets of the NFL’s most acclaimed kicking coach. Dallas Cowboys’ coach Steve Hoffman reveals techniques and training programs – proven in the NFL – that will dramatically improve the distance and accuracy of every kicker. Secrets to Accurate Field Goals! Dallas Cowboys’ Coach reveals 20 years of experience on 3 hours of video! This complete kicking program reveals the proven secrets of the NFL’s most acclaimed kicking coach. 3 mistakes every young kicker makes and how to correct them. Coach Hoffman’s exclusive technique for pinpoint accuracy. 5 new training tips guaranteed to build power and increase distance. See how the most popular method of holding often forces your kicker to miss! “He noticed every problem I had and created drills for me to fix them.” Richie Cunningham, All Pro. “Steve Hoffman is the best in the game.” Norv Turner, Head Coach Redskins. 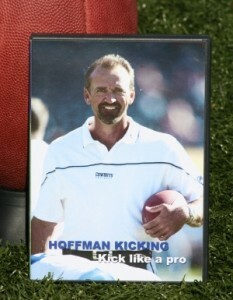 “Steve Hoffman has been able to develop kickers with tremendous results.” John Madden, Fox Sports. “I’ve watched Steve work magic with young kids.” Neill Armstrong, 34 year NFL coach. “My distance jumped! And my consistency improved dramatically.” Toby Gowin. “The Cowboys have had a great deal of turnover in their kicking positions, but they have always performed at a very high level. The one constant has been Steve Hoffman. He has been able to develop kickers with tremendous results.” – John Madden. From the proper steps for striking the ball with power to his exclusive secret for pinpoint accuracy, every facet of your kicking game will improve.